"BnF" and "Gallica" redirect here. For the compound abbreviated as "BnF", see Benzyl fluoride. For other uses, see Gallica (disambiguation). The Bibliothèque nationale de France (BnF, English: National Library of France; French: [bi.bli.jɔ.tɛk na.sjɔ.nal də fʁɑ̃s] ) is the national library of France, located in Paris. It is the national repository of all that is published in France and also holds extensive historical collections. Paris is the capital and most populous city of France, with an area of 105 square kilometres and an official estimated population of 2,140,526 residents as of 1 January 2019. Since the 17th century, Paris is one of Europe's major centres of finance, diplomacy, commerce, fashion, science, and the arts. The Louvre Palace is a former royal palace located on the Right Bank of the Seine in Paris, between the Tuileries Gardens and the church of Saint-Germain l'Auxerrois. Originally a fortress built in the medieval period, it became a royal palace in the fourteenth century under Charles V and was used from time to time by the kings of France as their main Paris residence. Its present structure has evolved in stages since the 16th century. In 1793 part of the Louvre became a public museum, now the Musée du Louvre, which has expanded to occupy most of the building. 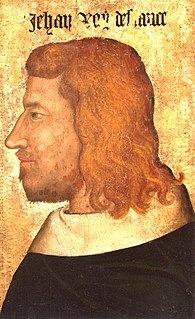 John II, called John the Good, was King of France from 1350 until his death, the second monarch from the House of Valois. Louis XI, called "Louis the Prudent", was King of France from 1461 to 1483, the sixth from the House of Valois. He succeeded his father Charles VII. Charles VIII, called the Affable, was King of France from 1483 to his death in 1498, the seventh from the House of Valois. He succeeded his father Louis XI at the age of 13. His elder sister Anne acted as regent jointly with her husband Peter II, Duke of Bourbon until 1491 when the young king turned 21 years of age. During Anne's regency, the great lords rebelled against royal centralisation efforts in a conflict known as the Mad War (1485–1488), which resulted in a victory for the royal government. Jacques Amyot, French Renaissance writer and translator, was born of poor parents, at Melun. 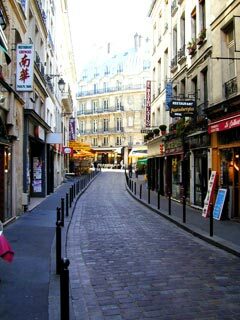 The rue de la Harpe is a street in Paris' Latin Quarter. Relatively calm and cobblestoned along much of its length, it runs in a south-easterly direction between the rue de la Huchette and the rue Saint-Séverin, where it turns south-west to where it ends at the boulevard Saint-Germain. It is a largely residential street; it is graced through its odd numbers with a few buildings dating from the Louis XV period, but buildings along the opposite side of the street are most all of a 'Haussmannian' style of a more recent stature. Its street-front commerces are varied to its southern end, but tend towards restaurants and the tourism trade towards the river. It appeared in the 19th century magazine, The Tell Tale, as the site of the murders which may have been the origin of the Sweeney Todd story. François Michel Le Tellier, Marquis of Louvois was the French Secretary of State for War for a significant part of the reign of Louis XIV. Louvois and his father, Michel le Tellier, would increase the French Army to 400,000 soldiers, an army that would fight four wars between 1667 and 1713. He is commonly referred to as "Louvois". Dom Jean Mabillon, O.S.B., was a French Benedictine monk and scholar of the Congregation of Saint Maur. He is considered the founder of the disciplines of palaeography and diplomatics. MelchisédechThévenot was a French author, scientist, traveler, cartographer, orientalist, inventor, and diplomat. He was the inventor of the spirit level and is also famous for his popular 1696 book The Art of Swimming, one of the first books on the subject and widely read during the 18th century. The book popularized the breaststroke. He also influenced the founding of the Académie Royale des Sciences. Camille Le Tellier de Louvois was a French clergyman and member of several royal academies in the reign of Louis XIV of France. He was the fourth member elected to occupy seat 4 of the Académie française in 1706. The Abbé Jean-Paul Bignon, Cong.Orat. was a French ecclesiastic, statesman, writer and preacher and librarian to Louis XIV of France. His protégé, Joseph Pitton de Tournefort, named the genus Bignonia after him in 1694. On 14 July 1988, President François Mitterrand announced "the construction and the expansion of one of the largest and most modern libraries in the world, intended to cover all fields of knowledge, and designed to be accessible to all, using the most modern data transfer technologies, which could be consulted from a distance, and which would collaborate with other European libraries". Book and media logistics inside the whole library was planned with an automated 6.6 km (4.1 mi) Telelift system. Only with this high level of automation, the library can comply with all demands fully in time. Due to initial trade union opposition, a wireless network was fully installed only in August 2016. As of 2016 [update] , the BnF contained roughly 14 million books at its four Parisian sites (Tolbiac, Richelieu, Arsenal, Opéra) as well as printed documents, manuscripts, prints, photographs, maps and plans, scores, coins, medals, sound documents, video and multimedia documents, scenery elements..."  The library retains the use of the Rue de Richelieu complex for some of its collections. Located near the Métro station: Bibliothèque François Mitterrand . The National Library of France is a public establishment under the supervision of the Ministry of Culture. Its mission is to constitute collections, especially the copies of works published in France that must, by law, be deposited there, conserve them, and make them available to the public. It produces a reference catalogue, cooperates with other national and international establishments, and participates in research programs. The library holds about 5,000 Ancient Greek manuscripts, which are divided into three fonds: Ancien fonds grec, fonds Coislin , and Fonds du Supplément grec. according to content: learned and bibliophilic, collections of learned materials, Library Archives, genealogical collections, French provinces, Masonic collection, etc. Alain Resnais directed Toute la mémoire du monde , a 1956 short film about the library and its collections. Jean Hippolyte Marchand was a French cubist painter, printmaker and illustrator with an association with figures of the Bloomsbury Group. The Cabinet des Médailles, more formally known as Département des Monnaies, Médailles et Antiques de la Bibliothèque nationale de France, is a department of the Bibliothèque nationale de France in Paris. The Cabinet des Médailles is located in the Richelieu-Louvois building – the former main building of the library – on the Rue de Richelieu. The Bibliothèque Mazarine, or Mazarin Library, is located within the Palais de l'institut de France, or the Palace of the Institute of France, at 23 quai de Conti in the 6th arrondissement, on the Left Bank of the Seine facing the Pont des Arts and the Louvre. Originally created by Cardinal Mazarin as his personal library in the 17th century, it today has one of the richest collections of rare books and manuscripts in France, and is the oldest public library in the country. The École Nationale des Chartes is a French grande école and a constituent college of PSL Research University specialised in historical sciences. It was founded in 1821 and was located first at the National Archives, then at the Palais de la Sorbonne. In October 2014, it moved to 65 rue de Richelieu, opposite the Richelieu-Louvois Site of the National Library of France. The school is administered by the Ministry of National Education, Higher Education and Research. It holds the status of grand établissement. Its students, who are recruited by competitive examination and hold the status of trainee civil servant, receive the qualification of archivist-paleographer after completing a thesis. They generally go on to follow careers as heritage curators in the archive and visual fields, as library curators or as lecturers and researchers in the human and social sciences. In 2005, the school also introduced master's degrees, for which students were recruited based on an application file, and, in 2011, doctorates. The Bibliothèque-Musée de l'Opéra National de Paris is a library and museum of the Paris Opera and is located in the 9th arrondissement at 8 rue Scribe, Paris, France. It is no longer managed by the Opera, but instead is part of the Music Department of the National Library of France. The Paris Opera Library-Museum is open daily; an admission fee is charged. The Human and Social Sciences Library Paris Descartes-CNRS is one of the most important French libraries concerning sociology, linguistics and science education. The library collaborates with BNF as an associated pole on topics such as health and public policy, Ethics and bioethics, Health sciences and society, drug use and abuse, social psychology. Joseph Basile Bernard Van Praet was a Flanders-born librarian and scholar active in France. Armand-Jérôme Bignon was a French lawyer, royal librarian and conseiller d'État. The Fontaine Louvois is a monumental public fountain in Square Louvois on the rue Richelieu in the Second Arrondissement of Paris, near the entrance of the Bibliothèque nationale de France. It was built between 1836 and 1839 during the reign of King Louis-Philippe. Henri Auguste Omont was a French librarian, philologist, and historian. The Imprimerie nationale is the official printing works of the French government, in succession to the Manufacture royale d'imprimerie founded by Cardinal Richelieu. Its Président-directeur général is Didier Trutt. The Théâtre National de la rue de la Loi was a Parisian theatre located across from the Bibliothèque Nationale de France on the rue de la Loi, which was the name of the rue de Richelieu from 1793 to 1806. The theatre was built by the actress and theatre manageress Mademoiselle Montansier, and opened on 15 August 1793. It was designed by the architect Victor Louis and had a capacity of 2,300 spectators. The theatre was demolished in 1820, and its former site is now the Square Louvois. The Bibliothèque de la Sorbonne is an inter-university library in Paris, France. It is situated in the Sorbonne building. It is a medieval institution of the Sorbonne, which evolved over the centuries as part of the University of Paris. It is a common library of Panthéon-Sorbonne University, Sorbonne-Nouvelle University, Sorbonne University, Paris Descartes University, and Paris Diderot University. It is administered by Panthéon-Sorbonne University as per a governing agreement signed among these universities in 2000. Paris, the capital of France, has many of the country's most important libraries. The Bibliothèque nationale de France operates public libraries in Paris, among them the François-Mitterrand, Richelieu, Louvois, Opéra, and Arsenal. The Bibliothèque interuniversitaire de Santé is a French medical library created in 2011. Jean Babelon was a 20th-century French librarian, historian and numismatist. The Société d'étude du XVIIe is a French learned society established in Paris in 1948 along the status of an association loi de 1901 in order to bring together specialists of this period and to develop studies on this century. 1 2 "La BnF en chiffres". Archived from the original on 2007-11-28. 1 2 Priebe, Paul M. (1982). "From Bibliothèque du Roi to Bibliothèque Nationale: The Creation of a State Library, 1789–1793". The Journal of Library History. 17 (4): 389–408. JSTOR 25541320. 1 2 3 4 5 6 7 One or more of the preceding sentences incorporates text from a publication now in the public domain : Rines, George Edwin, ed. (1920). "National Library of France" . Encyclopedia Americana . ↑ Dunton, Larkin (1896). The World and Its People. Silver, Burdett. p. 38. ↑ "University and Research Libraries". Nature . 156 (3962): 417. 6 October 1945. doi:10.1038/156417a0. ↑ Fitchett, Joseph (30 March 1995). "New Paris Library: Visionary or Outdated?". The New York Times . Retrieved 10 April 2013. ↑ Ramsay, Raylene L. (2003). French women in politics: writing power, paternal legitimization, and maternal legacies. Berghahn Books. p. 17. ISBN 978-1-57181-082-3 . Retrieved 21 May 2011. ↑ "Welcome to the BnF". BnF (Bibliothèque nationale de France). Archived from the original on 25 January 2016. Retrieved 17 January 2016. ↑ Horne, Alistair (1965). The Fall of Paris: The Siege and the Commune 1870-1. St. Martin's Press, New York. pp. 29–30. Bibliothèque nationale (France), Département de la Phonothèque nationale et de l'Audiovisuel. The National [Sound] Record[ings] and Audiovisual Department of the National Library [of France]. [Paris]: Bibliothèque nationale, . 9 p.
David H. Stam, ed. (2001). International Dictionary of Library Histories. Fitzroy Dearborn. ISBN 1-57958-244-3. Riding, Alan. "France Detects a Cultural Threat in Google," The New York Times. April 11, 2005. Wikimedia Commons has media related to Bibliothèque nationale de France .